Aaron Persad is one of 11 U of T alumni named to the Canadian Space Agency’s shortlist of candidates to become Canada’s next two astronauts. A postdoctoral researcher currently working in the lab of Mechanical and Industrial Engineering Professor David Sinton, Persad is one of 72 people from across Canada under consideration for two upcoming astronaut roles with the Canadian Space Agency (CSA). Any alumnus or alumna picked for the program would be following in the footsteps of such U of T astronauts as alumna Julie Payette and U of T Misissauga alumna Roberta Bondar, who took the crest of Erindale College, as U of T MIssissauga used to be known, into space with her as the first Canadian woman astronaut. Persad’s dream of going to space began at the age of seven and his pursuit of it accelerated at U of T Engineering. During his undergraduate studies, he completed his Professional Experience Year internship at the CSA, including a flight in a Falcon-20 jet where he got experience the sensation of free-fall for the first time. “It felt fantastic. I remember my legs had the tendency to float up toward my chest. I had to consciously keep them down,” said Persad. 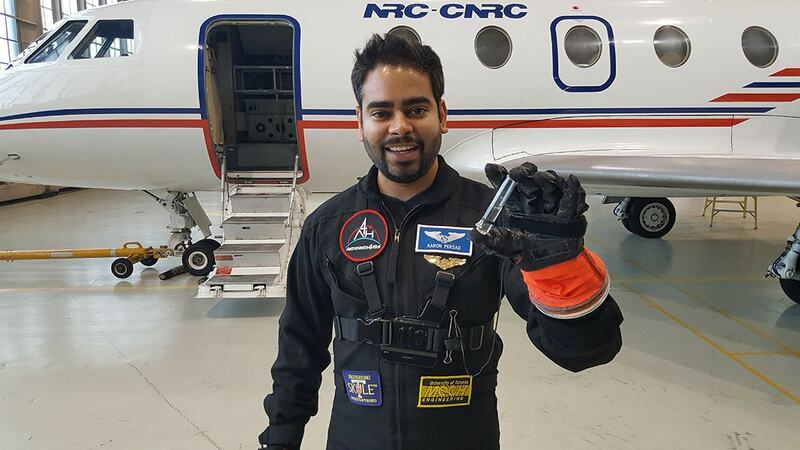 Persad’s PhD research, supervised by Professor Emeritus Charles Ward, focused on solving a decades-old mystery about the behaviour of water in microgravity, specifically the shape it takes within a closed container. The seemingly simple question has important implications for life-support systems in space. The project suffered a major setback when a SpaceX rocket meant to carry his experimental apparatus into orbit exploded in the summer of 2015. Undeterred, Persad created a new apparatus in time for the next launch in the summer of 2016. Last week, NASA astronaut Robert S. Kimbrough performed the experiment aboard the International Space Station. Persad is standing by for the data downlink, which will include videos and high-resolution images of the microgravity experiment. A final decision from the current round is expected by June 2017. “I know my family and friends are cheering me on,” said Persad.